← I’m a little bit explosionating. A favorite outfit is always a COMFY outfit. I woke up after 2.5 hours of sleep this morning and just wanted to keep wearing pajamas. The cool thing about a jersey dress and leggings is that they totally DO feel like wearing pajamas! The dress is from the Target girls section and is XL. It didn’t come with a belt, and I just slapped a white one on from another dress. 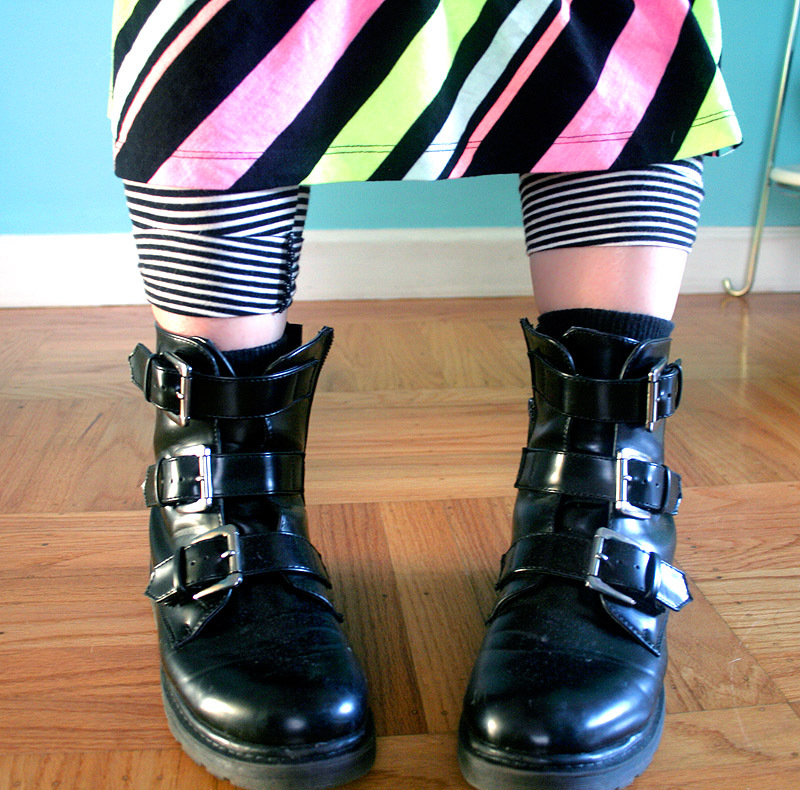 I figured I’d go CRAZY and pair a striped dress with striped leggings. SO CRAZY, YES!?!? The hero-accessory of this outfit, though, is really the watch. 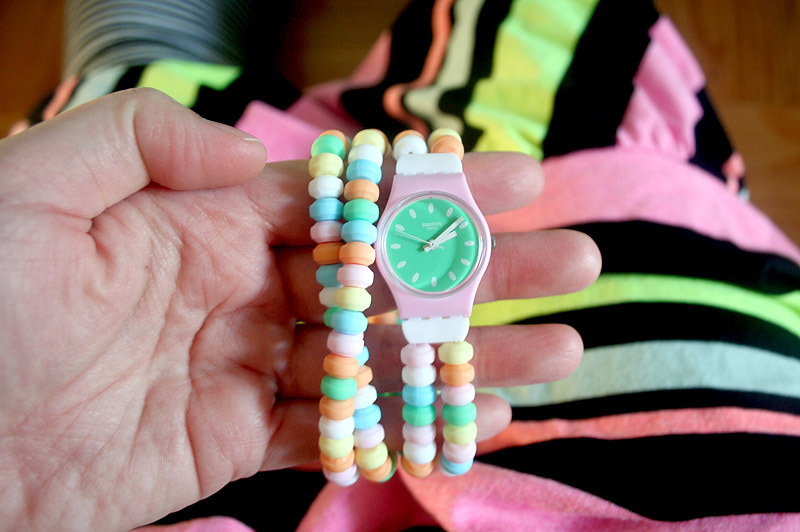 You know how I blogged about Swatch’s amazing sweets-themed watches, and I absolutely had to order the one that looked like a candy bracelet! I am completely 100% in love with it. It does have a tiny bit of a candy-raver feel to me, which was never really my personal jam, but overall I just think it’s totally amazing, and I am so happy this watch exists in the world! What do you guys have going on for the weekend? I still need to finish up my piece for the “Sugar High Club” art show and overnight it on Monday. I also have a Mom n Manda ladies lunch on Saturday, and on Sunday I hope to check out the Treasure Island Flea Market! Don’t forget that my February giveaway also ends on Sunday! I love the outfit, and the watch is adorable. I love your blog, and made the conversation heart garland. I will be crocheting birthday presents this weekend. Thank you for your inspiration! The sprinkles one is also very tempting!! I totally buy xl little girl’s dresses from Target too!!!! Haha. i love this watch too 😉 and your blog !!! !